The future is performance per watt. Given the way that the energy markets have gone during the past year, it was fairly obvious that there was going to be a focus on power, and performance per watt. Some may say that power is irrelevant and performance is key. While performance is important, performance per Watt is more important. Both Intel and AMD are focusing on ways of delivering more performance with less power - it is the future. We're facing rising energy prices everyday, and those numbers trickle down to everyone, whether you are drying your clothes, or running a few racks of servers at a datacenter. Recently, we spoke to a bandwidth provider in one of the largest datacenters on the US east coast. The datacenter that this provider uses for its services is out of power. They can't add any more racks because the datacenter doesn't have enough power. We're not talking about a small datacenter either; this is a very large datacenter that serves some of the world's largest websites. They can't get anymore power because government regulations won't allow it; so, now what? They have to find ways to reduce power consumption. Space is also a concern at most datacenters, so blade systems are becoming very popular at the datacenter. IDC recently forecasted that blade systems would reach 8% of the server market this year, from 2% a year ago. Blade systems may solve the space problem, but add to the power problem, as you end up with a more power-dense environment. 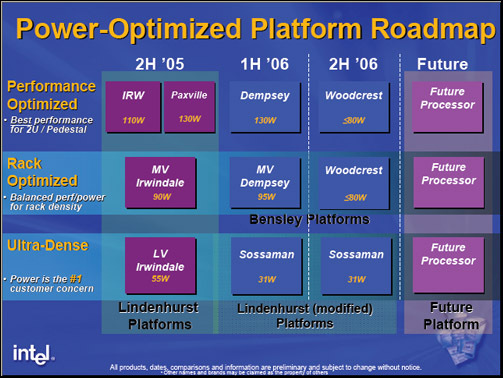 Intel's performance per watt play won't come into full effect until next year, with Woodcrest. Rough numbers for Woodcrest put it at somewhere in the 80Watt range or less. If you think back over the past few years at how the focus has been all about performance, people seem to have overlooked where AMD is in terms of performance per Watt. The Opteron has been competitive with Intel since its inception not only on performance, but delivering that performance in a lower power envelope. The Opteron 280 processor is a 95 Watt part already, and has been very competitive with Intel's Xeon. Index Test Configuration Index The future is performance per Watt. Test Configuration Database Benchmark Results Power Consumption Results How does power consumption affect the bottom line?